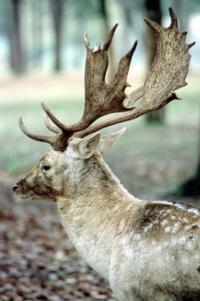 The Persian fallow deer is the largest of the fallow deer, weighing 40 - 100 kg (90 - 220 lb). It occupies woodland habitat. The diet of fallow deer varies by season and includes grass, nuts and leaves. Fallow deer live in herds, with males establishing territories during the breeding season. The Persian fallow deer previously occurred in North Africa from the Tunisian border to the Red Sea and in Asia from Syria and Jordan to Iraq and western Iran. It was hunted to extinction over most of its range, with the advent of modern firearms having accelerating this process. By 1951 it was thought to have become extinct, but in 1955 a limited number were found in a dense forested region in Iran, near the border with Iraq. This population persisted despite continued hunting and habitat destruction at least until the 1980's. Recently, conflict between Iran and Iraq has made it difficult to determine the deer's status. *** The antlers of adult male deer, such as the Persian fallow deer, distinguish them from animals with horns, such as antelope and goats. The antlers are bony like horns, but unlike horns they are shed and regrown each year. Female deer do not have antlers except for reindeer. *** Artwork from the 9th century BC shows fallow deer being farmed as domestic livestock. There is debate over the taxonomic status of the Persian fallow deer. It is considered by some to be a full species, Dama mesopotamica. Currently, the IUCN classifies it as a subspecies, Dama dama mesopotamica, of the fallow deer, Dama dama. The Persian fallow deer was first documented by Western science in 1875. It previously occurred in North Africa from the Tunisian border to the Red Sea and in Asia from Syria and Jordan to Iraq and western Iran. By 1951 it was considered to have become extinct, but in 1955 it was found to be surviving in limited numbers in a dense forested region along the Dez and Karkeh Rivers in Iran, near the border with Iraq. In the late 1970's, prior to when disturbances began in the region, this population was reportedly well protected and starting to increase in numbers. In 1987 the status of this population in what was currently a war zone was unknown. The Persian fallow deer was hunted to extinction over most of its range, with the introduction of modern firearms having accelerated this process. In the middle of the 20th century, in addition to hunting the remaining population was threatened by habitat loss and disturbance due to firewood gatherers and overgrazing by domestic animals. More recently, fighting between Iran and Iraq provided an additional threat. The Persian fallow deer weighs 40 - 100 kg (90 - 220 lb). The Persian fallow deer occurs in woodlands, such as tamarisk. About 16 months, but males do not breed for several years. Mating occurs in the Fall. Births occur in early summer. Usually a single fawn is born; twinning occurs rarely. Preliminary observations of the Persian fallow deer re-introduced into Israel suggested that reproductive success in the first season in the wild was low (~0.2 fawns/female/year) (Saltz 1998). The fallow deer is principally a grazer, with grass accounting for over 60% of its diet in summer. In the fall the proportion of fruits such as nuts increases. In the winter, the fallow deer browses on leaves. The fallow deer lives in herds. During the breeding season, males establish territories.